SPOILERS: Discussion of character relationships in Cardcaptor Sakura and Clear Card. The classic magical girl anime and manga series, Cardcaptor Sakura, is beloved by many people for its fun, adorable aesthetic, endearing characters, and LGBTQ-inclusiveness. The currently airing sequel, Cardcaptor Sakura Clear Card, takes place about a year later and attempts to recapture the magic of the original series. While Clear Card was created roughly twenty years after the original anime and manga, it so far seems less actively progressive than its predecessor. Specifically, it’s missing the original’s focus on explicitly representing LGBTQ characters as well as the way it sensitively portrayed their lives and emotions. Sakura’s best friend (and fan favorite) Tomoyo Daidoji is a perfect example of this issue. Tomoyo is Sakura’s number one fan, often recording her adventures and making her costumes. She’s also a surprisingly mature character who keeps secrets of her own. The original manga eventually makes it explicit that Tomoyo has unrequited feelings for Sakura, and while the anime removes the direct statement, it heavily implies the same conclusion. For many LGBTQ youths, it’s easy to identify with keeping one’s unrequited feelings for a straight friend concealed at one point or another—there is often the fear of rejection coupled with anxieties about the relationship crumbling entirely if the truth is revealed. 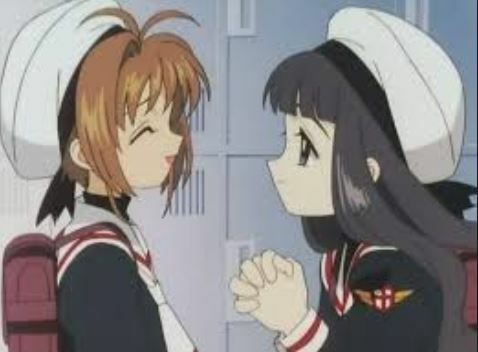 Those kids, who in the ‘90s were unlikely to find any representation, let alone from such a positive character, could find comfort in Sakura affirming her friendship with Tomoyo, even if she didn’t return her romantic feelings. Tomoyo deeply cared for Sakura, and was supportive as well as observant. Those elements remain in Clear Card, but at a cost. Clear Card Tomoyo is still rather observant, but thanks to murky plotting, her observations are almost entirely cryptic asides which fail to provide much insight into Tomoyo herself or even progress the narrative. Tomoyo is still Sakura’s biggest fan, but the scenes are played for comedic relief and with a focus on idolizing magical girls rather than her feelings for Sakura. Her unrequited crush isn’t brought up, there’s no mention of Tomoyo having moved on, and the series has yet to introduce a new potential love interest for her. That element is simply absent, and Tomoyo has no sense of character development from the end of the original series. This issue isn’t limited to Tomoyo, but extends to almost every one of the LGBTQ characters from the original series. The romance between Sakura’s brother Touya and his friend Yukito is one of the most memorable subplots of the original series, and one of the few LGBTQ-friendly elements which has shown any indication of still being present in Clear Card. In the original series, there’s an ongoing subplot about the slow development of Yukito and Touya’s budding feelings and the beginnings of their romantic relationship. Ultimately, after a lot of magical secret identities and miscommunication, the two realize how important they are to one another and end the series as a couple. Clear Card, despite taking place about a year into the pair’s relationship, references it only once in a brief exchange implying the two are having troubles. Despite having an opportunity to now show them together and emphasize their relationship, Clear Card forgets it. Neither character has even had much to do in the new series aside from the implication that Touya is keeping secrets. Unlike Tomoyo, there is an actual relationship to show here, but Clear Card takes no interest in it. Much of what made the the original Cardcaptor Sakura so special feels like it’s missing from the new incarnation. Ruby Moon, a genderless character who presented female and served as Yukito’s rival for Touya, is also barely mentioned in the new series. These all feel like glaring omissions given the way society outside of the series has changed. Many events have occurred in the real world since the original Cardcaptor Sakura series was published and aired two decades ago. Marriage equality has been achieved in many countries and a handful of areas in Japan. Manga such as My Brother’s Husband, What Did You Eat Yesterday, and My Lesbian Experience With Loneliness are being created which reflect a more grounded, authentic LGBTQ experience. And Yuri!!! on ICE pushed the boundaries by depicting a gay couple outside of BL and yuri anime. There is so much more Clear Card could be doing to explore sexual orientation and the gender spectrum in a way that speaks to a young, modern audience. Public awareness of the issues faced by the LGBTQ community is growing, and yet Clear Card has gone backward instead of forward, losing a big part of what made it stand out in the process. The original Cardcaptor Sakura series created a place where LGBTQ kids could see themselves in the entertainment they watched—and the heroes of the story were kids and young adults, something that can be hard to find even now in mainstream titles. The series holds a special place in the hearts of many people, so it’s frustrating that Clear Card is content to coast on nostalgia and broad characterizations of the original cast rather than pushing to be more in tune with modern times. There are still plenty of LGBTQ kids who deserve to have shows that represent them. Fortunately, the original Cardcaptor Sakura series is available in English both in anime and manga form. While Cardcaptor Sakura Clear Card is ongoing and could resolve these issues in the future, so far it feels like a missed opportunity. It could very easily have modernized itself and continued to be identifiable or even challenging to some contemporary readers and viewers. Rather than adapting with the times, Cardcaptor Sakura seems caught in a trap of its own nostalgia and past successes. The original series was an extremely slow burn, and there is still time for Clear Card to correct some of these issues. But, so far, it hasn’t. And that’s a sad fate for a beloved series. Geordi Demorest has a passion for writing. When he is not working on an article he is reading manga or light novels, going on Twitter watching anime, or playing video games. Geordis do not appreciate sudden movements or loud noises. If provoked, a Geordi will retreat to its bedroom, curl up in a blanket, and contemplate its existence.